Do these big cosmic events create meaningful change, and if so, why are the changes not always evident? Every event creates a ripple in the matrix of the Universe, whether it is a small event, such as taking a drink of water, or an enormous event such as a solar eclipse. In most cases, the scale of an event matters. Something inherently large will tend to have a more profound or far-reaching effect and vice versa. But scale doesn’t always matter as directly as you might expect. A small, private event can create enormous consequences, and a large-scale event can lead to very little outcome. Large scale cosmic events such as an eclipse or a harmonic convergence always have a profound effect on everyone and everything in the world, regardless of whether you pay attention or not. You often cannot see the changes enacted by cosmic events because, as humans, you can never see the entire outcome of your choices, or of events that occur around you. This is by divine design. Human consciousness is built to be incredibly adaptable. The moment something occurs, you adjust to it. Immediately after things change, your previous existence becomes a memory rather than a lived experience. Memories provide only slivers of what you knew when you were experiencing the event in “real time.” What you know in the present moment is monumentally more rich than anything you can remember. Human consciousness is built this way for many reasons. One reason is that you simply cannot keep track of all the information from every moment as if it were your present moment. Your mind would be overloaded. And your mind would be unable to fully appreciate the present moment. This is part of the way you were built to survive third dimensional reality. You must hold tight to the present moment so you do not let your consciousness slip to other moments, aside from revisiting them in your memory. When people cannot differentiate between what exists in the present moment from what is in the past or future, they develop a mental illness. In order to thrive as a human, you must have your consciousness present in the here and now — your location on the time-space continuum. Another reason human consciousness is built to forget the past is that this enables you to progress. It is incredibly useful to let go of your previous ways of thinking so that you can become the person you are growing into. There is very little value in having your conscious mind spend time and energy comparing your old ways of thinking to your new ways of thinking. This would be like buying a new computer, then spending the first few weeks with both computers open and doing all your tasks on both. Your higher self, also known as your spirit or soul, does the work of reviewing the upgrade and ensuring that you experience exactly what you need to with each event. Your conscious mind is built to feel what arises with each event and decide how to respond, thus setting the stage for how your next events will unfold. You can trust your highest self to coordinate the events of your life for your highest good. 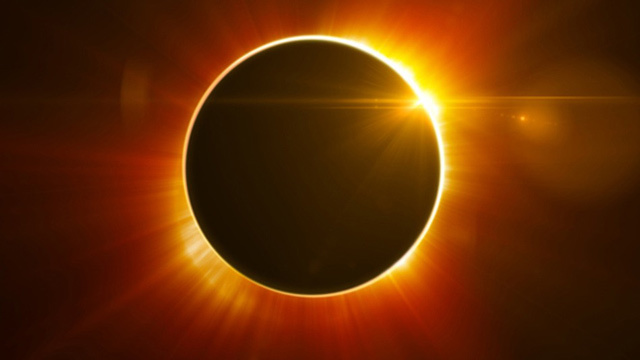 So when a big event occurs, such as an eclipse, your higher self has already set up the experience you will need to best use the energy of the event. Your job, consciously, is to be mindful of what you think and feel, then respond accordingly. Adapt along the way. Explore the lessons that arise. Relish the opportunity to experience it exactly as it unfolds for you. Use your own wisdom and compassion to help you make choices. Let each even enable you to be the best version of yourself you can be in that moment. Let your heart open and let yourself be changed. Then, you wake up the next day and things feel normal because you shifted. You have changed along with the situation, so it doesn't feel strange. It doesn't feel new. It feels like an article of clothing that fits perfectly because it has been tailor made perfectly for you by your highest self in careful coordination with all other beings in the Universe. You often feel more about an event before it occurs because you have become uncomfortable with yourself and the world around you. You notice the feeling of change coming. Once the change occurs, you relax again and the intensity dissipates. This can bring up a sense of disappointment, but what you feel is actually relief and a new comfort that seems almost boring. What more can we know about the personal and collective changes coming with the August 2017 Solar Eclipse? A total solar eclipse creates a profound experience of silence for those in the path of totality, and this silence ripples outward until it touches everyone on the planet. Silence opens the door for much to arise. For some, it brings peace. For others, it might bring up inner turmoil or fear. No matter where you are on the planet, you will be effected by this silence, and your reaction to what arises will shape the way the eclipse affects humanity. For those in the path of totality, the silence you experience will give you the opportunity to have a greater impact on how things change. It is an opportunity to have your love or your fear amplified by thousands of degrees. Choose love. If fear arises, choose to love yourself even though you are afraid. If you can, try to love what you are afraid of. Fear is not a problem if you choose love when it arises. There is a reason this eclipse is crossing through the middle of the United States, rather than in another part of the world, at this time. The year 2017 was always built to be a time of turmoil for the US. In fact, if you can imagine, even more collapse was intended for this year than you have seen so far! The fact that many of your systems are still working — including your economy, education, and healthcare — speaks to the profound effort of so many of you working to stabilize these systems as they undergo incredibly profound change. This eclipse was planned at the inception of the world in order to provide a resting point. This is meant to be a moment of silence in which all can connect with the quiet voice within. And this is what will occur, even for those who ignore the event itself or seek to distract themselves with noise. If you are in the path of totality, and for many of those near that path, your subconscious mind will collect the silence and use it for years to come. If you are not yet ready to listen to your own inner voice, this silence will wait inside you until you can listen. Silence is patient. For those of you who seek to consciously use this event for your spiritual work, the best thing you can do it to allow silence during the day of the event. Silence works best when you allow what comes. You can make noises and still hold silence, just as you can be quiet yet not feel a sense of silence within. Seek the inner silence that comes with being at peace with who you are and how you feel. Acceptance of what happens is a perfect practice for this eclipse. Enjoy the opportunity to laugh and ease into the things that don’t go as planned. Use humor, goodwill, kindness, and deep breathing to invite peace into your life during this event. The inner peace you cultivate will move through the world with no effort from you. The enormity of the eclipse will take care of the effort. Your work is simply to let the silence wash over you and sift through you. I'll be watching the eclipse with my family, so I'm not sure how well I'll be able to consciously hold silence for this event. But as the Keepers suggest, I'll let it be just as it is and enjoy it. And I'll be thinking of all of you, doing exactly what you need in your relationship with silence. I know that, together, we are making the world a better place -- one small event or big event at a time!